4th Qtr Specials To Target Holiday Traffic Released TODAY! Fall is in the air and Thanksgiving and Christmas are just around the corner! It seems too early to be talking about Christmas but the countdown to Black Friday is on. Children and adults alike are making their lists and according to a recent OAAA Sales Tip, the shopping has already started. A recent poll reflected that 38% start their holiday shopping by mid-October, 34% start on Black Friday and 18% start in early December. Consumers are spending on average over $800.00 during the holiday season with more than half of those shoppers splurging on items for themselves. Holiday spending is expected to increase more than 7% to 10% from last year. That influx should offer retailers the opportunity to convert browsers into buyers. Experienced retailers know in order to capture revenue, you must own the top of the mind awareness position in your industry. This means your brand is the first that comes to mind when a consumer thinks of a product or service that you offer. To maintain this status, businesses must remain diligent in their promotional efforts. Media experts rely on a blitz and sustain strategy during times such as these to ensure advertising dollars are spent efficiently and effectively. Savvy advertisers should focus their spending on key shopping dates, but not go silent in between. In today’s high pressure sales environment, you must be out there or you will quickly become invisible. 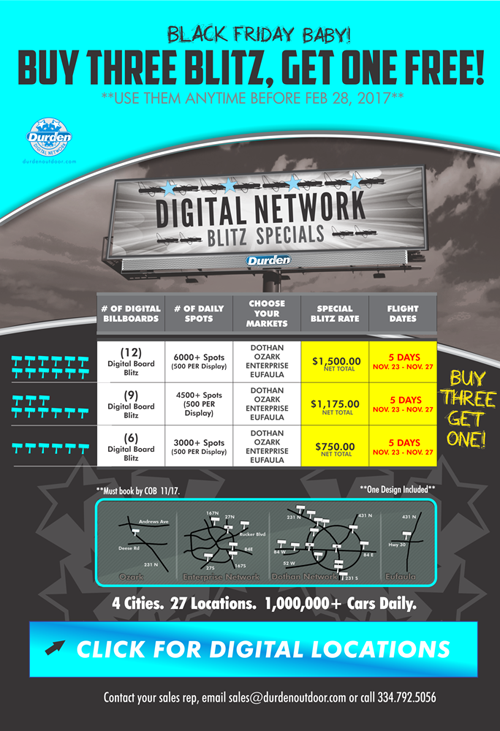 The Durden Digital Network is perfectly designed to capture your target audience with a heavier display schedule on key dates and a lighter (but not silent) spot load in between. 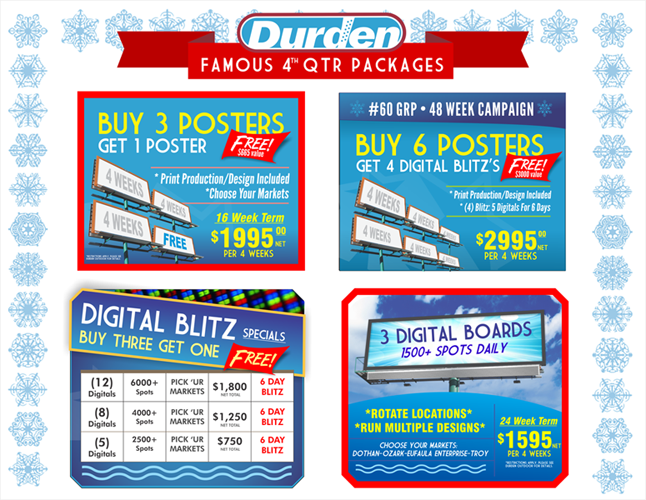 The team at Durden Outdoor has put together several packages to help you plan and focus your advertising in fourth quarter. Durden’s Creative Team provides excellent marketing and design support to all of our clients. Make sure that you are taking advantage of the upcoming high seasonal traffic. Even though it is only mid-October, it is time to put together your plan of action and finish out the year strong. Preparing for the holiday shopping season is an annual ritual that can’t be ignored. Start early and stay late – customers start holiday browsing earlier every year, but the decision to purchase may not come as soon as you expect. 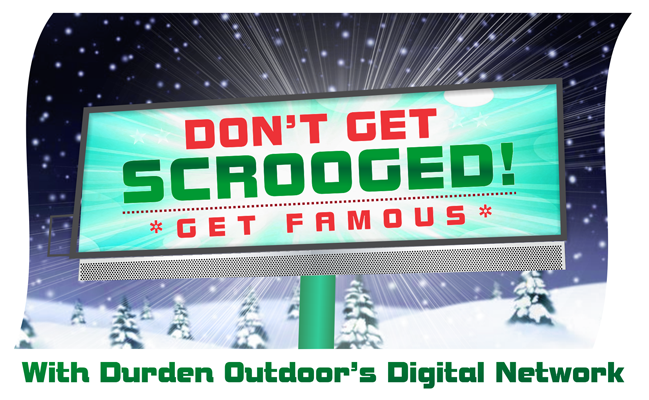 To learn more about the Durden Digital Network and current holiday specials, contact our sales department at 334-678-2215 or email us at sales@durdenoutdoor.com. http://www.durdenoutdoor.com/wp-content/uploads/2016/06/DUR-Footer-Logo.png 0 0 Amy Riddle http://www.durdenoutdoor.com/wp-content/uploads/2016/06/DUR-Footer-Logo.png Amy Riddle2016-10-12 20:26:182016-10-12 20:26:184th Qtr Specials To Target Holiday Traffic Released TODAY! The #FamousMakers at Durden Outdoor located in Southeast Alabama have always contended to be professional paraphrasers. We have a general rule to keep a headline shorter than 7 words as we only have 8-10 seconds to get our point across. While working on a new 2016-17 creative theme for one of our favorite clients, we achieved this goal…….plus we were able to add one new creative element on a billboard to push it over the top! CLICK TO SEE THE 3D NOSE VIDEO: https://youtu.be/GD9ocJnELrM Bryan Pharmacy is a locally operated pharmacy with 3 locations in Enterprise and Elba, Alabama. 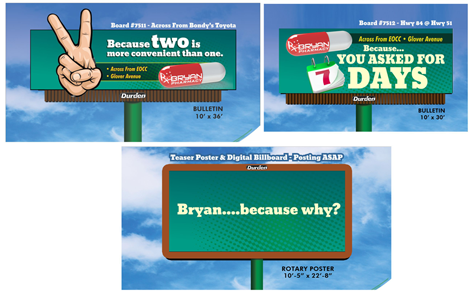 Check them out at http://www.bryanpharmacy.com/ Owner Brett Bryan knows that to compete against the big chains, he has to offer customers a better experience than the “BIG CHAINS” and be creative with his marketing budget. Because you asked for 7 days. Because we help your momma and ’em. 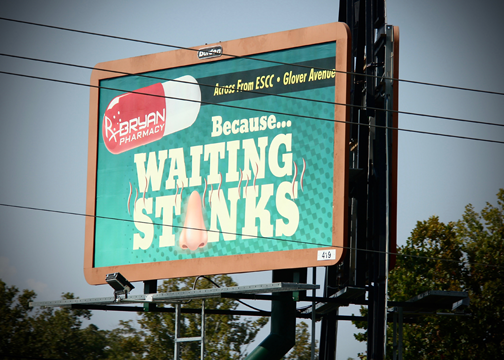 Check out Alabama’s largest 3D nose on the billboard next to Taco Bell on Boll Weevil Circle in Enterprise, AL. Durden Outdoor worked with Soft Signs in Ontario, Canada to complete the vision of creating and mounting the largest nose in Alabama onto a billboard. If you would like to be FAMOUS in the Wiregrass area, contact one of our image consultants at 334-792-5056 or by emailing sales@durdenoutdoor.com.